Do your 5th grade students need help finding a good chapter book to read? 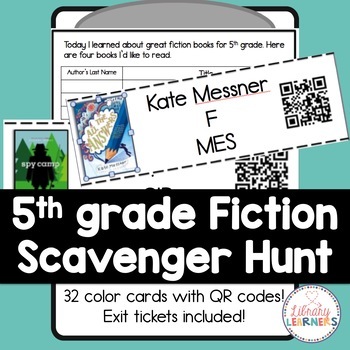 This low-prep library scavenger hunt with QR codes will get those fifth graders up and moving around, exploring fiction authors in your school library! Exit tickets provide accountability and a reading wish list for the future! This set of 32 printable color cards with call numbers, book covers, author names and QR codes will provide an engaging way to introduce your students to authors of chapter books that are perfect for 5th grade. Just print, cut out, and go! Check out the preview to see which authors are included. 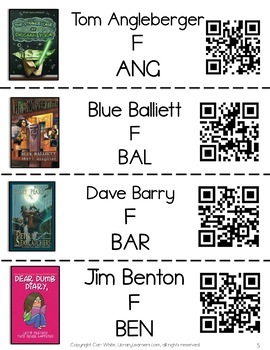 Your students can work individually or in teams to find a book by the author on the card. Print these cards on colorful card stock and laminate them for use year after year. When you aren't teaching a scavenger hunt lesson, use these cards at a library center to practice alphabetical order. 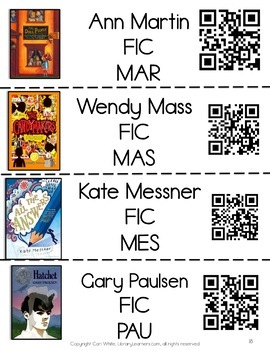 I've included two sets of cards, one with "F" in the call number, and the other with "FIC," so that you can use the cards that match the spine labels in YOUR school library. At our school, I use these cards to help our students explore the different areas of our library and find books that they are interested in. This is a great library lesson because students are actively engaged, they are using technology, and they genuinely enjoy the scavenger hunt! Because my customers asked for it, I include QR codes that link to Google Slides with an image of what they should find. The Google Slides ask students to read the blurb and first page of the book they found, and to write the title down if they'd like to read the whole book later. 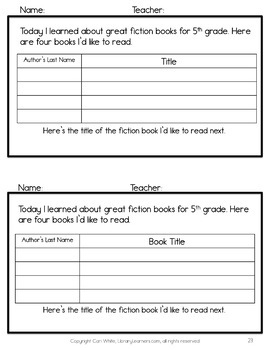 I include full and half-page recording sheets, so that students can write down the authors and titles of book they find and would like to read. You can use these as exit tickets to confirm that students completed the activity and met your expectations. My LIBRARY LEARNERS BLOG provides free tips, photos, and information to inspire, encourage, and equip school librarians! I OFTEN PROVIDE FREEBIES TO MY FOLLOWERS AND ALL NEW PRODUCTS DEBUT AT 20% OFF!